Over the next two years the Turnbull government will cut over $140 million from mental health services for young people. The cuts are not a result of any improvement in mental health. In Australia there are around 3000 suicides a year, roughly double the road toll. According to the Australian Bureau of Statistics around one in every five Australians will experience a mental disorder in any given year and 45 per cent will experience a mental disorder in their lifetimes. Those are staggering figures. The figures are similar in the US and only slightly lower in other developed nations. How do we explain this? Mental illness is a symptom of a society that breeds unhappiness and anxiety. Another answer is that the definition of mental illness has expanded, as drug companies promote the idea it is an illness that drugs can cure. “Capitalism is a sick social arrangement that damages physical and mental health. And, by expanding the definition of mental illness, more people can be labelled sick and more profits can be made from selling them treatments”. If there was ever a question about the social roots of mental illness the Australian government has unquestionably answered it with the horrific experiment of offshore processing of asylum seekers. A 2014 report by International Health and Medical Services (IHMS), who run detention health services, found that around half the asylum seekers and refugees on Manus Island and Nauru suffer from significant depression, stress or anxiety. Australian of the Year and psychiatrist Patrick McGorry rightly called them “factories for producing mental illness”. We have known for a long time that mental illness has social causes; links with poverty, unemployment and homelessness are well established. This is one reason the Turnbull government’s proposed cuts to Newstart Allowance are particularly cruel. 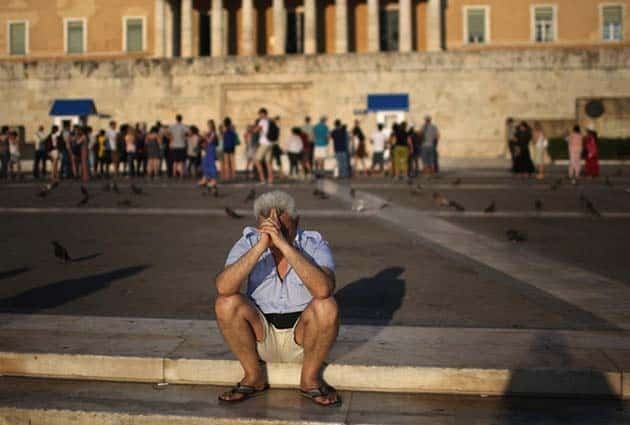 A study in 2015 by professors of epidemiology in Greece found that in 2011 and 2012 after harsh austerity measures were imposed from 2010, suicides increased by 36 per cent compared with the previous decade. Any severe trauma from war, to child abuse, to cancer, can contribute to mental distress, but the scale of mental health problems goes beyond those who have experienced trauma and requires explanation. Most people internalise the values of the society they live in from an early age. This includes the idea of being a “success”, the importance of competition, or their role in a family. Even people who come to reject particular aspects of this are not unaffected by the values of those around them. The contradiction between daily reality and what the system tells us to expect can cause mental distress. Life under capitalism can be a stressful and dehumanising experience. Many people perform routine jobs where they have no control over how the job gets done, or the pace and hours of work. They are often unable to speak openly about what is wrong through fear of unemployment. We’re told that if you can’t find a job that pays enough, or can’t find a job at all, it is your fault. The competition structured into capitalism means difficulties people face are usually explained away as personal failings. We are not taught to blame the system for its inability to provide decent jobs, social support, housing, or health care. It is surprising that anyone is mentally healthy under capitalism. Given the stresses and insanity of capitalism, mental revolt against the way things are is quite a natural response. The psychiatric industry, however, is not designed to tell people that their mental illness has social causes. Instead, as Susan Rosenthal writes, it should be understood as one of the “institutions of social control” that is designed to justify existing society. Psychiatrists categorise rather than diagnose causes. Physical diseases do not change throughout history, but what is considered “normal”, and how suffering has been able to be expressed, has always been a political question. What psychiatry considers illness is shaped by the ideology and needs of those who run society. This can be seen in the some of the changes in what has been considered a mental illness. The condition drapetomania was coined by physician Samuel A. Cartwright in the 1850s. He claimed its main symptom was slaves “absconding from service”, and it was caused by masters who “made themselves too familiar with [slaves], treating them as equals”. Because he believed in the necessity of slavery, the idea that trying to escape might be a logical response apparently eluded him. Black people in US today are more than three times likely to be diagnosed with schizophrenia than whites. In the 1960s at the height of the civil rights movement, the definition of schizophrenia in the DSM was broadened to include the words, “aggression”, “hostility”, and “delusions of persecution”. At the same time left wing psychiatrists campaigned to have racism defined as a mental disorder, but this was rejected by the American Psychological Association on the basis that racism was normative. Even today, as Rosenthal writes, “Psychiatry serves capitalism by diagnosing defiance as a mental disorder. Psychiatrists and psychologists have pathologised the protests of slaves and political dissidents. They have lobotomised rebellious women and tried to convert homosexuals. They have campaigned for the euthanasia and sterilisation of ‘social defectives’. They assist at interrogations and torture. Conversely there is commonly regarded as nothing wrong with people who imprison refugees, wage war or order drone strikes. The people who carry out drone strikes however have reported high levels of mental health problems. Official definitions of what constitutes mental illness have also been expanding, particularly in the US where conditions listed in the Diagnostic and Statistical Manual of Mental Disorders (DSM) determine insurance payments for treatment . Doctors Shorter and Tyrer argued in the British Medical Journal in 2003 that, “Industry has been busy behind the scenes in this handy convergence of eccentric new diagnoses and the market niching of compounds”. Well they might, as sales of anti-psychotic drugs top sales of all other drugs. Eli Lily rebranded Prozac as a pink pill called Sarafem in 2001 after the DSM listed Pre-Menstrual Dysphoric Disorder. This also allowed it to extend its patent by seven years. GlaxoSmithKline took a broader approach with the drug Paxil, marketing it with slogans like, “The Paxil treatment, treat one. Treat them all,” and, “look for the Paxil spectrum in every patient”. GlaxoSmithKline hid data that showed Paxil as ineffective with risky side effects. They ended up paying out $1.3 billion in compensation for suicides and birth defects associated with Paxil. However that was a tiny portion of the $15 billion they made from Paxil sales between 1997 and 2006. The psychologist R.D. Laing noted than mental illness is diagnosed by conduct, but treated biologically. The drugs given to people are not treating known biological mechanisms. This means the causes of mental illness are usually more complex than can be dealt with through simple drug-based remedies. In an article in New Scientist in June this year, Clare Wilson questioned the effectiveness of Selective Serotonin Reuptake Inhibitor (SSRI) drugs (such as Prozac), which are designed to work by increasing levels of the chemical serotonin in the brain. Irving Kirsch, a lecturer in medicine at Harvard, went further. He used Freedom of Information requests to get unpublished drug company trial results. Kirsch argues in The Emperor’s New Drugs that when considered together with published studies the results show that most SSRI drugs are no better than placebos. Others argue that the drugs are slightly better than placebo. Studies in the field are difficult because there is no objective definition of which patients to include, and any improvements are generally self-reported. However when it comes to objective measures such as suicide reduction across a population, the drugs have no effect. Drug companies are pulling their money from new research. Since 2000 they have reduced spending on new mental health drugs, and in 2011 four big companies pulled out altogether saying that it was too expensive and had produced no results. The focus on individual as opposed to social causes of mental illness has led to attempts to explain it as a result of genetics. It may be that there are interactions between genes and the environment that predispose some people to dealing better or worse with particular situations. But it would be a mistake to think that individual genes for schizophrenia or depression will be found, any more than genes for “intelligence” will be found. One factor is simply the complexity of interactions between genes, the social and physical environment, and early development. Some studies have claimed to show a small statistical association with particular gene regions and schizophrenia. Leaving aside the difficulty of defining schizophrenia, these studies are not predictive. That is, the majority of people who have the genetic variations do not have schizophrenia or any signs of mental illness. There is a greater link between schizophrenia and living in a city than having a family member with schizophrenia. Working class people are more likely to be diagnosed with schizophrenia, and as mentioned earlier, so are black people in the US. People diagnosed with schizophrenia can be unable to differentiate between what is real and what are fantasies. Rosenthal writes of Schizophrenia: “Human perception is socially constructed. The ideas that dominate society shape what people think, what they want, who they trust, who they fear, who they blame, and what is and is not acceptable. Schizophrenia usually develops during adolescence, when the effort to make sense of the world and one’s place in it is at its most acute. Mental illness is a disease of society. This means that the best treatment within our existing society is based on increased social support and attention. Just as austerity can cause mental health problems, raising living standards can have the opposite effect. Another study in the US found that after a new casino began paying out bonuses that lifted some poor families out of poverty, psychiatric problems among children in those families fell to the same level as in better off families. Their parents could afford to properly look after them and satisfy their needs for the first time. Other forms of social support are also important. In the 1960s as protest and strikes spread across the globe the psychiatrist R.D. Laing coined the popular slogan “Do not adjust your head, the fault is in reality”. The best way to deal with the social problems that cause mental health is to fight back, and win victories that begin to challenge them. Similarly the Arab spring and the toppling of dictator Hosni Mubarak led to his hospitalisation for severe depression. Capitalism is a system based on deepening inequality which makes life a misery for millions of people. But the global working class has the capacity to end the oppression and poverty it produces, through uniting grassroots struggles everywhere into a fight to overturn the system. A socialist society run in the interests of the majority is possible. But, as Susan Rosenthal comments, “don’t expect this diagnosis will ever appear in the DSM”. I am loathe to criticise Soli mag, I think it’s a fantastic magazine, and I know and have great respect for several of its contributors. However, this article is so problematic – I’d go so far as to say irresponsible – that I can’t let it go unchallenged. I’m disappointed to see that Chris doesn’t appear to have responded to any of the valid and constructive criticisms of this piece from the audience during his presentation of it at Keep Left. As was pointed out by many people then, the article is deeply problematic, and some of the arguments presented can actually be quite dangerous. It is worth pointing out that the author has no background in mental health, or indeed any health discipline, or even biology. The logic of this piece is informed purely by ideology. I’m not saying that society is not sick; it is. And I’m not saying societal factors can’t trigger, exacerbate or increase lifetime risk of developing a mental illness or disorder. But societal factors can also increase risk of developing heart disease and cancer – that doesn’t mean that they don’t exist or shouldn’t be treated as illnesses. The term ‘mental illness’ encompasses a wide range of illnesses and disorders, from psychotic disorders like schizophrenia to mood disorders like anxiety, depression and bipolar. Treating them as if they are all the same makes as much sense as saying that heart disease and lung cancer are both ‘physical illnesses’ and therefore we’ll evaluate the treatments and causes as one. It’s simply wrong to imply that if some SSRIs don’t work for some people for treating depression, that anti-psychotics are ineffective in treating schizophrenia or to imply that all drugs are no better than placebo. It’s simply demonstrably false. Not treating for serious conditions like schizophrenia and bi-polar disorder can be fatal. “Simple drug-based remedies”, as they are referred to here, can be life saving — although I don’t think many people on these drugs would describe them as a simple, easy or quick fix solution. There’s also a hint of blame attribution here – this idea that the only contribution of genetics to mental illness and disorder “some people to dealing better or worse with particular situations”. Are mentally ill people just of weaker constitution, who can’t cope as well with the constructs of capitalism as those who are well? There is a great deal of evidence that conditions from bi-polar to schizophrenia have genes that predispose people to risk. Of course there are other risk factors and like everything there is often a complex interaction between various factors that can increase and decrease a person’s risk of developing a disease. Socio-economic factors can be very important in this, and no geneticist worth their weight would claim that genes are the only factor. Just because there are many people with a gene variant associated with a disease (genotype) who don’t have the condition (phenotype), does not disprove genetic predisposition. The disease phenotype is thought to arise from a complex interaction with other susceptibility genes as well as environmental factors, including those mentioned in the article. It is rare that known genetic risk factors constitute single genes whereby a person with that genotype always develops the disease, be it a mental or physical illness or disorder. Huntington’s disease is one of the few exceptions. It’s true that there have been misuses of psychiatry, and it has been to discriminate and control. However such things have also been perpetrated by the medical establishment (forced sterilisation of ethnic groups, medical experimentation on minority and indigenous groups). This is abhorrent but such disgusting abuses still do not invalidate all that is known in the field of psychiatry, just as it does not invalidate medical knowledge. I agree with some of what the author is trying to get at. Capitalism is the root of a great many problems in our society, and the problems that it creates – deep inequality, social isolation, the nuclear family, the 40 hour work week, urban living and separation from nature, can all contribute to making people physically and mentally sick. However, there are other complicated factors at play, and at the end of the day, mentally illness – whatever the root causes – is real. It needs to be treated according to the current medical/psychiatric knowledge – while we should also be working together as a society and as activists to try to address modifiable causative factors and build a better, more equal and healthy society. Nothing wrong with criticising us! Hope I’m not putting words into his mouth but I don’t think Chris is saying that people with mental illness should refuse to use drugs or refuse treatment. Clearly drugs do help some people. And people do only have access to the remedies that exist in society as it currently is, and based on the level of medical knowledge that we currently have. Acknowledging the oppression and alienation that exist under capitalism can help people in some situations (one telling example is the treatment of Vietnam War vets in the US with PTSD, see this review https://www.marxists.org/history/etol/newspape/isj2/1998/isj2-079/neale.htm). But we can’t escape the society of which we are a part, or our upbringing. At the same time I don’t think it’s right to draw an analogy between heart disease and cancer and mental illness. As Chris spells out diseases of the mind are far more complex, and our understanding of how the brain works is still very poor. There is no comparison between the medical understanding of how cancer works, for instance, and how depression or schizophrenia work. “the problem has not been a failure to identify links between mental disorders like schizophrenia and bipolar disorder and specific genetic differences between individuals, but rather the bewildering number of these. So a recent study found more than 120 regions of the human genome that were different in schizophrenic individuals compared with unaffected ones. And I think when Chris says “It may be that there are interactions between genes and the environment that predispose some people to dealing better or worse with particular situations”, he is making the point that it is “particular situations” i.e the social context that drives mental illness, and some people develop the ability to cope better than others not just because of genetics but because of upbringing, class background, environment etc. I don’t think the intention is to blame to individuals for their ability to cope. There was no blame attribution in my article. To explain a bit more.. for instance in Greece the economic crisis increased the rate of suicide, this is fact. But there are differences between people, not everyone affected by the economic crisis committed suicide. However I certainly don’t think that those who did were ‘weaker’ in any possible sense. We are all susceptible to shocks from the system given the right (or rather wrong) circumstances .Many ‘environmental factors’ could affect suicide, from class, to racism, to sexuality, to family support, to personal circumstances and history, to age, to physical health issues etc. I don’t rule out genes playing a role in mental health, but if they do it is likely to be a complex one, that involves interaction with the environment (in the broad sense of the word), and there is not yet clear evidence. I agree that not all mental illness is the same, and can have different causes (for instance physical damage to the brain can cause mental illness). But there is a difference between mental illness and diseases such as heart disease or cancer. There is no objective definition for either schizophrenia or depression, these illnesses are classifications, rather than diagnoses in the medical sense of the word. Unlike diagnosing cancer or heart attacks, evaluating behaviour is very subjective (which is a problem for research in the mental health field). Physical diseases do not change over time, but the definitions of mental illnesses are constantly changing. The drugs for depression (SSRIs) and anti-psychotics for Schizophrenia were both discovered accidentally (through observing the effects they had on people). In both cases they are treating symptoms, not underlying causes. Yes they have an effect on people, because they change brain chemistry. That’s not a prescription on my behalf. I am not a doctor, and I am certainly not going to give blanket advice about taking drugs or not taking drugs. Mental illness is real, and it needs to be treated, but there is much evidence that the current psychiatric model is wrong, and that treatments are therefore ineffective. Firstly, the statement ‘mental illness is a disease’ is wrong – ‘mental illness’ is not one disease. It is a catch-all term just like ‘physical illness’. And as I argued in my post above, mental illnesses have a variety of causes and risk factors. There is a wealth of epidemiological evidence for this. Secondly, and more importantly, it’s wrong to dismiss pharmacological treatments of mental illness in this way. Of course, for many conditions, social support is very important, and may in fact be more important than pharmacological treatments. Cognitive behavioural therapy has also been shown to be very effective for some disorders – as effective as SSRIs for treating anxiety. But because that’s true for one type of drug treating one condition, it doesn’t mean that it’s true for treatments of other conditions, like bi-polar disorder or schizophrenia. This is just such a simplistic analysis. Regarding the DSM, of course there are valid criticism of what is or was included. However, the majority of conditions are unquestioned. Nobody is challenging the inclusion of the most common and well known conditions in the DSM – no one would claim that the various anxiety disorders, depression, bi-polar, schizophrenia, obsessive compulsive disorder, etc etc don’t exist. It’s right to be critical when natural variability in personality or behavioural traits are being overmedicalised and turned into diseases. But it just doesn’t invalidate the entire knowledge base that we have on mental illnesses. As I said, I think there some truths in the piece, but that the oversimplifation and sweeping statements are wrong and irresponsible. I appreciate your point of view though James, thanks for taking the time to explain your perspective. It’s not true that there’s no clear evidence for the genetic role in various mental illnesses. It’s true that in some cases, familial studies have been clearer than molecular ones. Molecular epidemiology is time consuming, expensive, and has a lot of challenges including sample size limitations. Even where directly related genes haven’t been found, for example for bipolar, genes with moderate levels of association have. While acknowledging that mental illness is real and needs to be treated, in the same breath you are just dismissing the entire wealth of medical/psychiatric/epidemiological knowledge, and saying that all treatments are ineffective. There could be a case to be made against SSRIs in the treatment of depression. That also doesn’t say anything about SNRIs, MAOIs, etc etc. Nor does it saying anything about non-pharmacological treatments commonly prescribed, phychosocial therapies such as cognitive behavioural therapy. I’ll also point out that depression is not the only thing that SSRIs are used to treat. The evidence should be evaluated for each treatment and condition. The paper you linked about schizophrenia drugs treatment didn’t conclude that anti-psychotics don’t work – it found that people who don’t take them for a prolonged period did not relapse any more often. That doesn’t mean it wasn’t effective in treating acute episodes.It also points out the inherent selection bias in the study – that is, that the group that chooses not to be on medication for prolonged periods are different in a range of individual, environmental social characteristics to those who do, so it can be hard to tease out how much of the differences in outcome are due to treatments and how much due to these other favourable characteristics. Robust debate about causes and treatments is hugely important, I agree, but it should be based on rigorous and peer-reviewed evidence from epidemiology, basic science and clinical research, not on political ideology. I can understand where you are coming from, but it’s not as black and white as you are presenting it. John Parrington whom James quotes argues that “unwise to discount the possibility of genetic tendencies to mental disorder” that may be, but claiming that genetic tendencies have been well established does not stand up on available evidence. The studies you provide are all meta-studies that don’t provide any specific genetic mechanisms, I discuss some of the problems with them further below. But firstly even if it turn out there are genetic ‘tendencies’ for some specific disorders, they can’t by themselves explain why those people are fine at some times, but not at others. And they can’t explain the sheer numbers. 45 percent of the Australian population will experience a mental health issue in their lifetime, & 20% at any one time. Even allowing for over diagnosis, how can that be down to genetics? If so then close to half of us could have the gene variations, you might as well say the problem is having human genes. To suggest for instance to those on Nauru, or Manus where over half are currently suffering serious mental health conditions, that their problems are likely to be down to genetics, is surely both cruel and implausible. (I am not saying you are claiming this, but it highlights problems with attempts at genetic explanation). All the studies you provide are meta studies, which are highly dependent on selection criteria for which studies to include. Meta studies can play a role in scientific analysis, but very often it’s a case of junk in, junk out. I couldn’t open the specific twin review you provide, but one of the problems is it is difficult to find enough identical twins to report meaningful results, for instance the suicide rate in Australia is about 12 per 100,000 per year, there are about 1200 identical twins born in Australia each year, assuming they all stay alive until 80 (an overly generous assumption), there couldn’t be more than about 90,000 identical twins in Australia, which would make 12 at most who would commit suicide in a given year (& that is an over estimate). Even if the surviving twins all agreed to take part in the study, its not enough to produce meaningful results. As another example The California Twins Autism Study over turned decades of previous autism twin study claims http://www.ageofautism.com/2011/07/new-autism-twin-study-demolishes-decades-long-belief-in-genetic-causation.html . It used 192 twin pairs, which was four times as many as any other previous study (by the way I wouldn’t classify autism as a mental illness, I am using it simply for the purpose of talking about twin studies). Many studies that do report particular gene region associations report only small effects, many have either not been reproduced or are later contradicted, and there is good reason to believe that many are flawed. One of the biggest problems is that there is no objective criteria for which patients to include in the studies, there is no objective definition of schizophrenia or depression. Parrington refers to Jonathan Flint’s depression study in China. Flint himself is wary of claiming too much & had a very good article in 2009 on why so many reported ‘genetic breakthrough’s’ are simply wrong and often contradicted by later studies. It’s right to critically examine scientific research as you suggest, as the peer review process doesn’t always work and poorly done studies do get published, and there is a growing recognition of the problem of reproducibility (or lack thereof). This is, however, a good reason to look at metastudies, since there is only so much you can conclude from single studies. It’s clear that I wasn’t arguing that rising rates of mental illness are down to an increase in prevalence of genetic traits for susceptibility, nor implying anything about the folks on Nauru and Manus. Clearly social and environmental factors are important. It’s complex, and it’s not either/or.